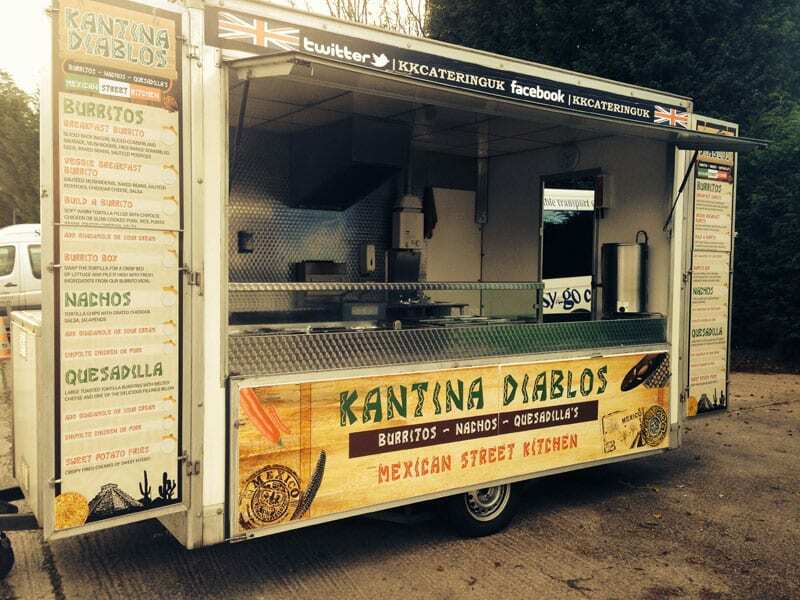 If you want to experience the very best street food Mexico has to offer then look no further than Kantina Diablos – our Mexican street food van, which is the latest street food mobile catering unit from the UK’s leading event caterers KK Catering. Our Mexican street food van uses the freshest ingredients in order to bring traditional Mexican recipes like burritos, nachos and quesadillas to life.So whatever the event you’re planning – whether it be a party, a wedding, a music festival, or a sporting or corporate event – we have both the proven track record and the ingredients to make sure your guests can enjoy the authentic taste of Mexican street food. Your guests will be able to choose from 12 hour smoked pulled pork or tasty chicken breast, which is all served with lime and corriander rice, fresh guacamole, pico de gallo and sour cream. Then there’s the quesadillas – which is like a Mexican-style stuffed pancake, a bit like a toasted sandwich, made with large toasted tortillas bursting with melted cheese and a choice of delicious fillings. They’re a taste sensation and will go down a storm with your guests. You can start the day with a burrito, too, Our breakfast burrito option is filled with delicious sliced-back bacon, Cumberland sausage, mushrooms, free-range scrambled eggs, baked beans and sautéed potatoes. Breakfast burritos also come ready for vegetarians – just hold the bacon and sausage and replace it with cheddar cheese and salsa. If you want to bring the authentic taste of Mexican street food to your event then use the form here to get a quote for our Mexican street food van & take the 1st step towards making your event special.